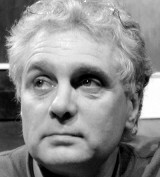 Kenneth Brown is one of Canada’s most prolific writers for the theatre. He’s performed at more Canadian Fringe Festivals than anyone. Kenneth and his work have traveled the world. He’s also spent 30 years teaching theatre at Grant MacEwan College in Edmonton. In our conversation Kenneth refers to himself as a “mountebank insane poet.” His passion for theatre is infectious and he discusses the things that continue to drive his desire to create art that moves people. We discuss Fringe Festivals and theatre as a creative spontaneous act. We also cover world travel, studying theatre at The National Theatre School with Colm Feore, Ann-Marie MacDonald & Judith Thompson, and the problematic relationships we have with our fathers. This summer you can see Kenneth at the Fringe Festivals in London, Winnipeg, and Edmonton. Check out episodes that also mention Edmonton, Fringe, National Theatre School, Writing.